Un poco alejado remontes. Pero el aparcamiento gratuito lo compensa. 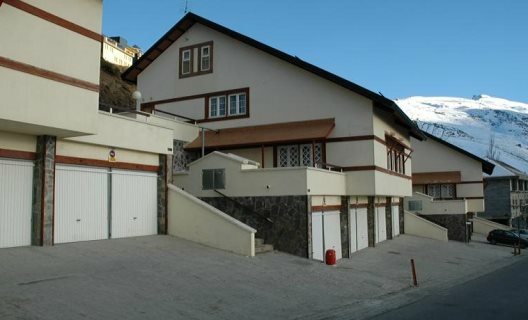 Residencial Las Tuyas has a total of 30 practical apartments, which are equipped with everything you need to make you feel at home and you can enjoy a few pleasant days of vacation in the Sierra Nevada, southern-most ski resort in Europe. In addition, if you come by car you won't have to worry about parking problems, since you can leave it in the garage of the enclosure. The complex is located in the middle of the station, just 200 metres from the stop of the Parador chairlift. It's a perfect place for lovers of snow sports, since here they will have more than 80 kilometers of ski slopes and sunny days throughout the year. If not skiing equipment has been brought or not available don't worry, since here you will be able to rent it, as well as to receive initiation classes. And if you have time we encourage you to visit Granada, lost on the streets, to get to the Albaicín district and admire the wonderful view of the Alhambra from the mirador de San Nicolas. Don't visit the caves of Sacromonte and tapas in the bars of the city. Gourmands can not leave without tasting the typical piononos of Santa Fe.